I am writing only for my shadow, which is now stretched across the wall in the light of the lamp. I must make myself known to him. 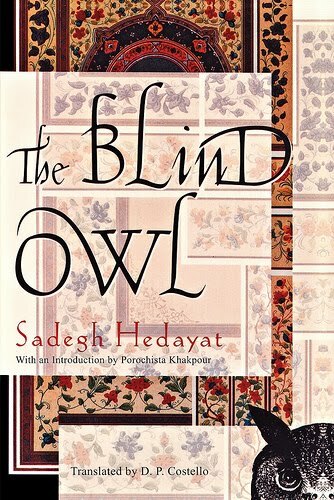 Everything I know about The Blind Owl author Sadegh Hedayat is that he wrote The Blind Owl and, in 1951, on a trip to Paris, he committed suicide. Without knowing that last bit, simply reading the first thirty-odd pages of this very slender novel would have put into my head the idea that his end was most likely self-inflicted. It is hopeless and despairing and bizarre from page one, and so far it reminds me of nothing so much as the short horror fiction of the notably mentally unstable Thomas Ligotti. I doubt very much that Hedayat would have placed his book into that or any other genre; I suspect he regarded it as an accurate representation of his brain. But then, so does Ligotti of his own fiction. This is all relevant, or relevant-ish, because I first learned of The Blind Owl from Robert Irwin's entry for it in Stephen Jones and Kim Newman's Horror: Another 100 Best Books. Which I hasten to add I haven't read, because those books, invaluable as they are, tend to not mind spoiling things too much, but one way or another I was intrigued enough to get myself a copy of Hedayat's book. Where I am, about a fourth of the way in, the narrator is already secluded in his home with the corpse of the woman of his obsession, who arrived only to haunt him and then die, in that order, while he attempts to capture her image in a painting. It is a mad book, already, written by a sadly mad man, whose legacy will be madness. It is uncomfortable, hence, possibly, my flippancy. I recognized the title from the very same Jones and Newman volume you referenced. I don't personally recall there having been any major spoilers revealed in both the first 100 and its sequel that made me cry "Oh, you ASSHOLES!" at least, but my memory might be fuzzy. Spot-on with the Ligotti description. I like him, but MAN can those stories really get you down. But I think that's the reason why his work, and your insights into The Blind Owl, intrigue me enough to want to read them. There's a very potent attraction to darkness that they have, and there's something so fascinating (but equally daunting) about reading fiction from genuinely, ahem, crazy people. John Farris completely ruins OUTER DARK for anyone who has never read it, I know that. Fortunately, I'd read it by the time I got around to his essay, but I'd have been way pissed off if I hadn't. I tend to think that horror should get you down a little bit, if it's doing it's job right. Of course, I hardly hold on to this as a hard and fast rule, but most of the best horror fiction I've read fits into this idea. As great as I think Ligotti is, though, and I think he's one of the maybe two or three best horror writers alive, he does put a little distance between his brain and the reader with his more or less recognizable plots. That's not really a knock, because I love the story aspect of his, you know, stories, but so far THE BLIND OWL seems more purely mad to me, and therefore makes me more uneasy. It's also pretty brilliant in the way it presents the character's madness, and it's probably too easy to assume certain things about the Hedayat who wrote this book because I know he would eventually commit suicide (some 40 years later, though). Still, the plot of this book is the character's insanity, and that's pretty much it. So far, anyway.